A project that began with a simple idea to deliver the magic of cinema to children in Africa has not only led to a cultural exchange but to an unlikely collaboration — the production of a music video by Japanese and Ugandan elementary school children. Cinema Stars for Africa, a roaming theater project that travels mainly around northern Uganda, was launched in 2016 by photographer and writer Naoko Sakuragi to give some African children their first-ever taste of the silver screen. 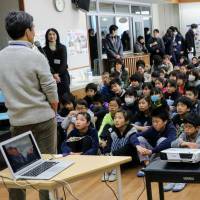 An exchange of letters and video messages between students from a Tokyo elementary school, where Sakuragi periodically teaches about her activities in Africa, and Ugandan children ensued the same year. Sixth graders from the Tokyo school even put on a play portraying Ugandan child soldiers who had been abducted and forced to fight in the country’s decades-long civil war. “It was a very serious performance and the children wrote the script themselves, but in the end, they talked about the importance of peace,” Sakuragi says, referring to the play performed at Toyotama Minami Elementary School in Tokyo’s Nerima Ward. “The children continued the video letter exchanges and then imagined the idea of collaborating on a music video project,” she adds. In 2017, her voluntary group, whose predecessor had created in 2013 a scholarship trust fund for “smart Ugandan children who are in need,” held movie screenings and art workshops in Edea, located on Cameroon’s Sanaga River, and Uganda’s Gulu, which endured more than two decades of civil war from the early 1990s. Sakuragi, 40, who has been taking photos in Africa since 2001 and published a photo essay in August 2011 about children living through Uganda’s civil war, says she embarked on the cinema stars project after getting financial backing from people moved by the photos and poignant stories from her essay. It was during her travels to the region amid the raging civil war that she had a light-bulb moment — the idea that cinema could replicate the soothing effect bonfires had on the children who would take refuge in a shelter built in northern Uganda by a Japanese NGO. Some of the children in the shelter had been abducted by guerrillas in the past. It is estimated that the Lord’s Resistance Army abducted and forced nearly 38,000 children to serve as soldiers, or in the case of girls, soldiers’ “wives,” during the war. The children’s fire-gazing reminded her of the rapt expressions often seen in a cinema — the projector light, like the bonfires in Uganda, acting as a salve to heal the wounds of war. Cinema could also be a tool to educate, she says. But the cinema stars project would not materialize until several years after the conclusion of the civil war, many of the survivors of which were now young adults with children of their own, struggling to support their families and reintegrate into society. Sakuragi crowdfunded over ¥1.5 million (about $13,500) for the project. 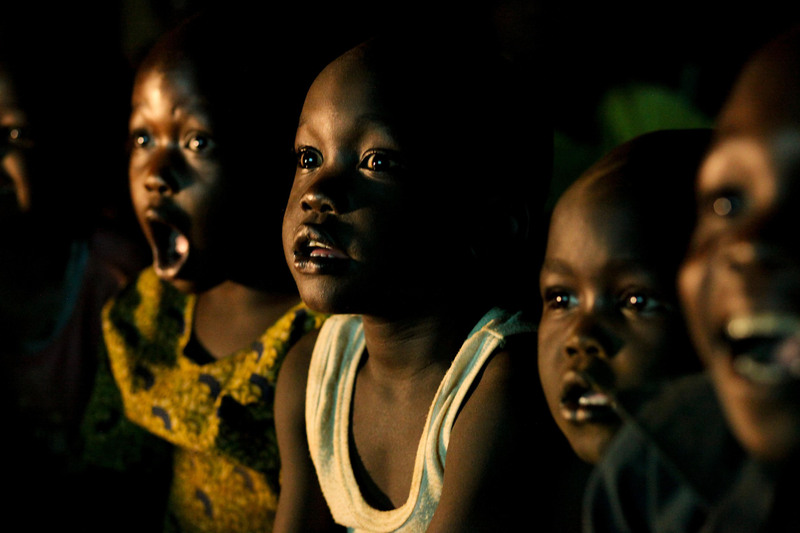 Over two years, around 700 African children have watched movies with cinema stars. They have been shown titles including the children’s international award-winning animation “Matasaburo of the Wind,” the story of Kenji Miyazawa’s original work, among others. Since the project’s inception, nearly 1,000 kids, about 500 each from Japan and Uganda, have corresponded. 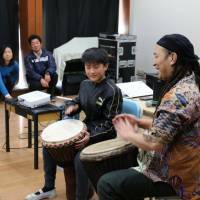 In July 2017, sixth graders at the Tokyo school began production of the “Under the Stars” music video with their counterparts in Uganda, enlisting help from professional musicians. Musician Gen Nagahara, 46, composed the lyrics and produced the arrangement and recording. The video was filmed separately in each country. Nagahara’s Kenyan friend, who performs African dance, showed the Japanese children some moves, but the sixth graders decided to use their own choreography in the end. He says the song’s title signifies being “one under the stars,” regardless of country. The four-minute, 47-second video shows the children smiling and laughing while dancing in unison and taking turns dribbling a large soccer ball which they appear to pass to their counterparts in the other location. 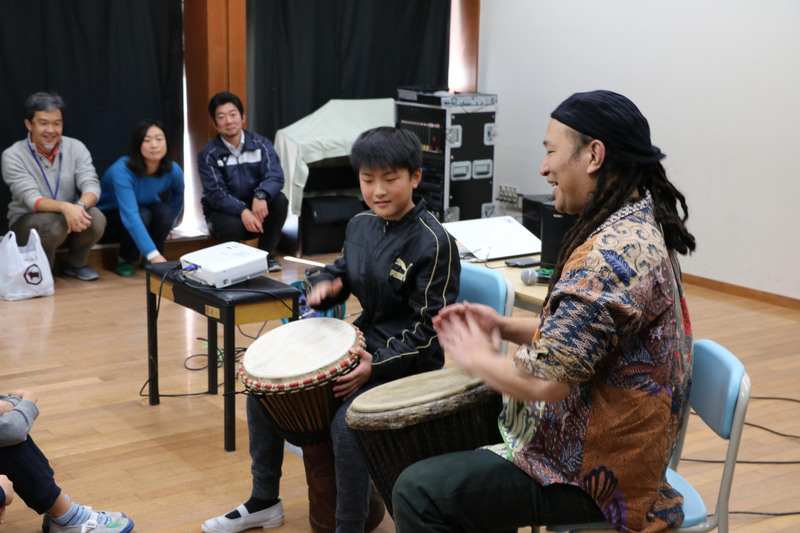 “I didn’t just want to see the end result but wanted to share the joy of what they created,” says Nagahara, who attended the video’s Jan. 13 premiere screening and demonstrated African djembe percussion for the fifth- and sixth-graders who gathered at the school. Shunichi Takeishi, 52, the sixth graders’ faculty head, says the purpose of the music video collaboration was to teach his students about children their own age, ensuring they understand that, no matter the circumstances or home country, they hope to enjoy life as much as anybody else. He says the project was meaningful because the children were able to participate rather than just listen to or read a story. “We wanted to teach our children that the children in Africa are just like them, even though their country had a civil war. 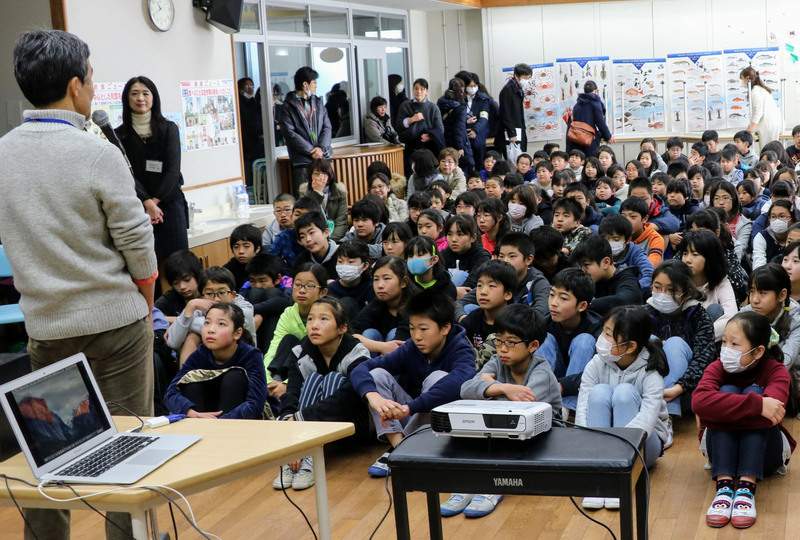 This is important to gain an understanding of the world,” says Takeishi, adding that the kids had also proposed a crowdfunding campaign to bring children from Uganda to Japan or vice versa, but it never came to pass. Dabide Denishi, 11, a fifth-grader who hopes to be involved in the next big project, got to try his hand at the djembe. “Getting the drum to make a high-pitched tone was hard. I am very interested in going to Africa in the future,” Denishi says. As for Sakuragi, she hopes to travel to Uganda in March and present the completed music video to the children there. In August, she plans to travel there again to put on more cinema and illumination events for villages with no electricity. The goal of her crowdfunding campaign, “Hikari Africa Project” is ¥1.3 million. “The Japanese children will make lamps of origami and exchange them with the lamps made by children in Africa. We will bring over light artists from Japan. We want to try to bring light to the darkness in Africa,” she says.